Skunk cabbage gets its name from the cabbage-like leaves and the odor of skunk that assails anyone who breaks or steps on it. Here its tiny flowers are visible as dots on the egg-shaped knob within the red hood. Just as surely as the first crocuses open in our gardens, our native skunk cabbage gives us the first wild blossoms of spring in Westborough's swamps. We generally know skunk cabbage (Symplocarpus foetidus) by its huge green leaves, which come up promptly in spring and grow rapidly to a couple of feet in size. You may have already seen some of its leaves this year. The skunk cabbage flowers get an even earlier start, usually in March (but not this year) or early April, before any other wildflowers appear. Skunk cabbage grows so predictably in wet areas that it's one of the plants that serves as an official wetland indicator. You don't have to explore one of Westborough's five major swamps--Cedar Swamp, Crane Swamp, Orchard Swamp, Assabet Swamp, or the outflow from Hoccomocco--to see skunk cabbage. You'll find it in many wet places, maybe even in a ditch or a wet area behind your house. As you look for skunk cabbage flowers in swamps or along stream banks, you'll notice fleshy, pointed hoods poking up from the mud. They are shaped somewhat like conch shells. They're often mottled red or brown, but they can also be green or entirely dark red. Sheltered inside each hood is an egg-shaped knob covered with many tiny flowers. And then there's the famous smell. Skunk cabbage gives off a foul odor if it's broken or stepped on. Insects and animals with keener noses than ours can smell it even when it isn't broken. The odor is like the pungent aroma of skunk or the stench of rotting meat. It's due to a couple of chemicals that can also be found in decaying flesh or plant matter. Like the scents of other flowers, this odor attracts insect pollinators to the plant. Early bees have no trouble locating skunk cabbage. They don’t get any nectar, but they make off with pollen, which serves as food for them. Some of the pollen also rubs off on other skunk cabbage flowers that the bees visit. Flies come as well, drawn by the scent of carrion and perhaps also the meat-like color of the hoods. Tricked, perhaps, by the scent and sight, flies crawl around inside the hood, picking up pollen as they search for a place to lay their eggs. Skunk cabbage has other chemical tricks besides mimicking the odor of dead meat. It's not exactly warm-blooded, but skunk cabbage does produce its own heat as it comes up. The hooded flowers sometimes even melt snow as they push their way up in the spring. In spite of chilly spring air, the temperature inside the hoods can be close to 70 degrees. What good is this heat to the skunk cabbage? It helps to give this first flower of spring its early start, creating warmth that helps pollen and other reproductive parts to mature. The heat may also help to spread the skunk-like scent into the air. And the heat attracts and rewards insects, which warm themselves inside the hood before moving on to another plant. Skunk cabbage contains yet another chemical defense. A caustic chemical, calcium oxalate, burns and blisters the mouth of any animal that tries to eat it. This chemical probably also prevents insects from feasting on the plant. In spite of the droves of insects in swamps, you generally don't see insect-eaten skunk cabbage leaves. Like so many other plants with chemical defenses, skunk cabbage has been put to numerous medicinal uses. Native Americans used it in warm wet dressings for wounds and swelling. Different Native American groups found ways to use it for toothaches, whooping cough, seizures, and migraines. European settlers learned from the Native Americans, and physicians of the past used it to treat spasms in epilepsy, coughs, and asthma. People also applied it in lotions for itches and rheumatism. It's no surprise that we don't think of skunk cabbage as an edible plant. Yet it has been a source of food in the past. Thorough drying is the secret to removing the plant's burning quality, as some Native Americans discovered. They ground the thoroughly dried roots to make a flour and used early spring leaves in stews after drying them in the sun. Skunk cabbage is well suited to life in the shady environment of most swamps. 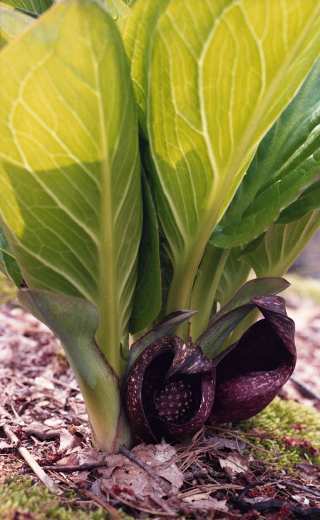 With its large leaves, skunk cabbage soaks up as much scarce sunlight as possible. Its leaves also shade out competing plants. At the same time, skunk cabbage creates favorable environments that benefit other creatures. The big leaves offer shelter for animals such as frogs and even birds. Many kinds of spiders find skunk cabbage a good place to capture visiting insects. If you peer inside the hoods that protect the flowers, you may find that a spider has already built a web across the opening. Follow-up to Nature Notes of April 1: If you go to Osprey Point with your binoculars to view the heron's nests off shore, you'll see that a pair of osprey and two pairs of great blue herons are back. The great horned owl, featured in the previous Nature Notes of April 1, has already departed, probably chased away by the protective osprey. It's unlikely that eggs or owlets survived.